If you want to be successful in life, consider hiring a life coach. Coaches have been an important part of many people’s lives around the world, and oftentimes, their success is brought by these coaches. 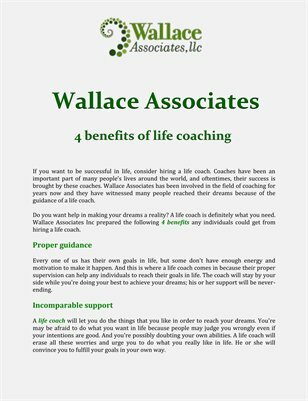 Wallace Associates has been involved in the field of coaching for years now and they have witnessed many people reached their dreams because of the guidance of a life coach.